Ah, vacation season! You've finally arrived! Andrew and I have been calling 2018 "Do Everything Year," because we are literally doing all the things. We're (mostly) out of the ickiness that characterized the early part of our marriage. We're pre-kids. We're young and our expenses are manageable. No time like the present, right? In planning our 2018 getaways, we didn't fully consider the big picture in regards to scheduling. Our vacations were scheduled for late June/early July, late August, and mid September. So for the first half of the year, we waited and waited and waited to get to this point! Now that we're finally here, we basically get to party for 3 months. Birthday Month (August) and Love Month (September) are already month-long celebrations in our family, and now we get to add Vacation Season into the mix! HUZZAH! Our first vacation was a family trip to Western Michigan with Andrew's immediate family, coordinated by the world's best in-laws. Seriously, friends, I won the lottery when I married an incredible man, and as a bonus, he came with delightful parents. They sought out the family lodgings, and we ended up staying on the north side of Holland in a big lake-side vacation rental. Also, this was our first trip with our brand new mirrorless camera, and thus we have even more photos than we would usually have of said glorious views! We happened to be vacationing in a heat wave, which is unusual for the Holland area. Temps were in the 90s most of the time, and the house didn't have AC outside of a spare window unit or two. Eeek! Regardless, we managed to have a lovely time, enjoy the scenery, and explore the surprisingly abundant offerings of Holland, Saugatuck, and Grand Rapids. If you like to be on the water, Holland is for you. 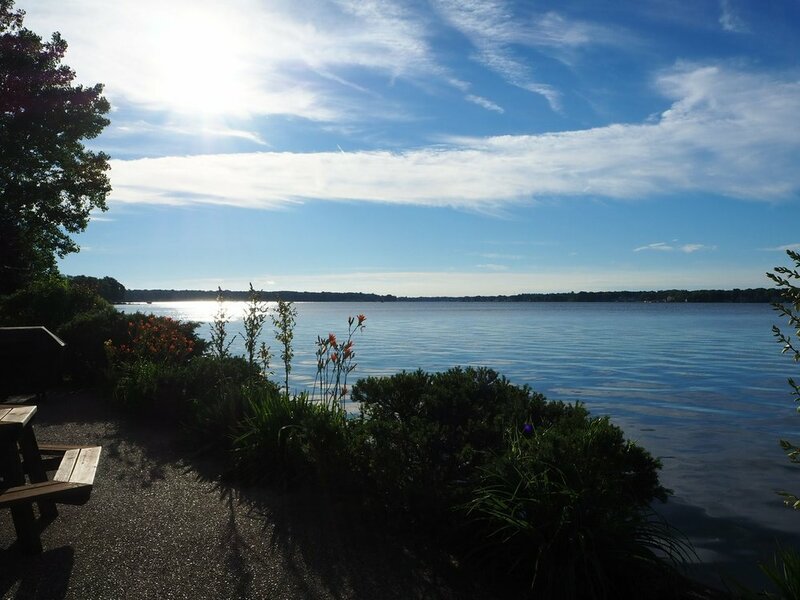 There are plenty of opportunities to get active out on Lake Macatawa: paddle boarding, jet skiing, boating, tubing, and fishing to name a few. And just down the road, you can go to the beach and pretend you're looking at the ocean. Lake Michigan is certainly big enough to mimic a coastal beach environment! There are ice cream stands, hot dog shacks, and everything you might expect to find in close proximity to a beach. We enjoyed walking down to the General Store for some seriously yummy--albeit melty--ice cream with cousins and kids in tow. Alas, Andrew and I aren't beach people. I don't like being hot, and water creatures freak me out. Andrew also hates being hot, and prefers to be more active on vacation. But even with the beach and water activities out the window, we were not at a loss for things to do and see in Holland. The farmer's market is impressive, packed with great local produce and a surprising number of vendors. The downtown area is charming, lined with fun shops and restaurants in a compact, walkable area. Our favorite downtown Holland find was Cherry Republic, a regional store connected with a farm that sells a bunch of products inspired by Andrew's favorite fruit. The original cherry salsa is a game-changer, and if you don't believe me, you can taste-test it in the retail store along with many other delectable goods like chocolate covered cherries, cherry barbecue sauce, and yes, cherry wines. But back to the salsa. Buy the salsa. Buy a jar, then buy a second and third jar to hide from your loved ones, because this stuff won't last long! By divine intervention, a delicious Dutch bakery had a location right down the road from our vacation rental, and people. Listen. The cake donuts and muffins were phenomenal. Ignore the regular donuts, they were mediocre. But the cake donuts and the muffins in flavors like lemon pistashio, cranberry orange, raspberry...oh goodness. I'm drooling. In fact, they were so good that I have zero photos to evidence the pastry feasting that occurred on multiple occasions. We ate them too quickly to even stop and consider taking a picture. Just go to Deboer Bakkerij and try the goodies for yourself. They also offer a full sit-down breakfast menu! The Dutch influence in Holland is hard to miss. The city was founded by Dutch Americans, and the remnants of that history are evident today. Almost everything in Holland shuts down on Sundays, for example. The Tulip Festival is legendary, and we hope to get up north for that some day. But year-round, attractions like Nelis' Dutch Village remind you that yes, indeed, you are in a town with Dutch history, and darn it, you will immerse yourself in it! Dutch Village is hard to explain. It's a kid-friendly attraction plopped down in a strip mall parking lot that attempts to recreate the ambiance of an actual Dutch Village. The result is something campy and touristy, but also weirdly charming and fun for young kids. Andrew and I visited entirely because of peer pressure, and with a good deal of reluctance--Dutch Village is not our normal vacation pit stop. But regardless, we had a fun time running around with our niece and nephew. The all-inclusive entry fee is stellar because you can hop on rides as many times as you want without juggling tickets or paying per ride. Dutch Village also features a petting zoo, including terrified bunnies who are daily harassed by toddlers. Poor lil bunnies. They're also for sale, which means a bunny could be permanently and irrevocably abducted by a not-so-gentle toddler! I wouldn't wish that sort of life upon any of the animals present, chickens and llamas included, but the kids love the animals. And I got my bunny snuggles in, too. Here's a photo of me trying to instill a particularly frightened bunny with telepathic vibes of calm and false safety. So, if you're looking for a place to let the kids run wild, ride a carousel, pet a bunny, or buy a custom pair of Dutch wooden shoes with your name burned into them, there you have it! Dutch Village has the whole package. About 15 minutes south of Holland is Saugatuck, a teeny little lakeside town with an artsy vibe and a walkable shopping/gallery district. I cannot overstate how tiny this town is. You can easily walk the full shopping area in half a day, with plenty of time to wander and peruse the goods. There were a lot of B&B's and inns scattered around the town, which left us scratching our heads. Perhaps some people do spend more than half a day in Saugatuck. We started our morning in Saugatuck at Grow, a cafe I selected in advance thanks to good ol' Google. Our breakfast was so good that we went back to the restaurant a few hours later to grab a lavender lemonade, which was also delightful. We shared the off-menu daily special (smoked fish salad with pickled eggs, crudite, and crostini) as well as the carrot cake pancakes. The pancakes were good, but the smoked fish was downright heavenly. The service was excellent, our particular server was attentive and knowledgable, and we had an all-around fantastic experience. In the name of review integrity, I have to tell you that the patio chairs wreaked havoc on both of our backs. We actually went to the car, retrieved our ground camp chairs, and nestled them into the patio chairs to improve the experience. Never before have I loathed a chair that much. Uncomfortable seating aside, though, we would certainly return to Grow in the future. The rest of our morning in Saugatuck was spent wandering the shops and art galleries. We didn't find anything that we actually wanted to buy, although we nearly walked away with some goodies from American Spoon, a gourmet grocer with tempting samples available for tasting. In general, the collection of shops and galleries in Saugatuck seemed scattered and random. It was a fun little day trip experience, but not the sort of place I'd want to stay for days at a time. We wrapped up our time in Saugatuck with a large group lunch at Coral Gables, a large restaurant with a nice waterfront patio. The menu was basic, but the food was tasty and simple dishes like a veggie wrap had creative touches that were pleasantly surprising. Traditional American diners will be pleased with the gargantuan portion sizes. Oh, Grand Rapids. What an unexpected delight you were! Long before we actually left home for vacation, Andrew and I planned a half-day date excursion into Grand Raids, an easy 35-minute drive from Holland. We originally planned to go the botanical gardens, but it was a zillion degrees, so we opted for an indoor eating marathon instead. Our Google research helped us to hone in on the East Hills neighborhood for an afternoon and evening of foodie heaven. The neighborhood was lovely, walkable, and home to some of truly fantastic culinary finds. We started the afternoon with a late lunch at The Electric Cheetah. This restaurant is officially my dining establishment spirit animal. For starters, the entire menu is Hamilton-themed, and bursting with so many references that I photographed the whole dang thing in stupid amounts of detail. The kitchen specializes in craft root beer and mac and cheese. I mean, who came up with that combination? Weirdly, it works. We sampled two varieties of root beer and ordered "The Brothers Mac and Cheese Plate" per our server's thorough recommendation. Everything we consumed was magic, particularly the mac and cheese. In case you aren't sold yet, there's an unexplained Karate Kid reference on the back wall of the restaurant. And because the owners of this place are about as fun as humanly possible, there's a sandwich on the menu called The Yahtzee. When you're finished with your meal, a server delivers dice to your table on a tray. If you get a Yahtzee in three rolls, you can shout YAHTZEE! super loud and get your sandwich free of charge. Ah! I miss the place already. From there, we wandered up to Lake Drive for a digestive respite. Le Bon Macaron was fine. The tea was fine, the atmosphere was fine. We didn't go for the macarons, so I can't speak to those. But after visiting The Electric Cheetah, something about the place left us feeling a little "meh." I probably wouldn't return unless I was really hankering for a place to sit down and drink tea pronto. Now that I'm spelling out this afternoon in Grand Rapids in writing, it sounds positively gluttonous, but I will press on regardless. From tea we walked next door to Brewery Vivant. Evidently, Grand Rapids has a CRAZY craft beer scene. There are microbreweries and pubs on every block, and the city has lovingly adopted the nickname "Beer City, USA." Founders is actually based out of Grand Rapids. Who knew, right? Brewery Vivant piqued our interest for a few reasons. First, the beer reputation. Second, the food reputation. And third, the bar and dining area housed inside of an old chapel. The result is a warm, inviting neighborhood pub that just may be the grown-up (I mean, real?) version of the Great Hall in Harry Potter. Andrew and I both felt that we could've stayed there all day, eaten ourselves into blissful oblivion, and probably made a bunch of new friends amongst the local patrons. The menu was tempting on multiple counts. Since we had dinner reservations in a couple hours, we skipped the duck nachos, but obviously those would be worth a try! Instead, we opted for dessert and an appetizer from the seasonal menu: strawberry shortcake with grilled berries and a sweet biscuit, and the "bread and butter" platter with bone marrow herb butter, tart berry jam, and house-made spent grain bread. Though the presentation left something to be desired, the food was excellent. I considered ordering a second round of strawberry shortcake because the biscuit was so tasty. And yep, you saw that right -- that's a photo of a demolished bread and butter plate, because again, too good to remember to photograph in advance. We also created our own beer flight, which allowed us to sample four of the brewery's finest. I loved the Tropical Saison, and Andrew, for some reason, was charmed by a limited seasonal release: rhe Blackberry Tart Side. Sours are definitely not my thing, but kudos to Vivant for pleasing my husband's selective palate. We very nearly cancelled our dinner reservations and stayed put in the comfort of the hall, but our curiosity for dinner won out in the end. Keep doing your thing, Brewery Vivant. We'll definitely be back soon. Grove is part of a Grand Rapids restaurant group called Essence that quickly rose to the top of our foodie dining list. Though the other restaurants were tempting, we elected to visit Grove because of a seasonally-inspired, creative American menu, and the option to order from a separate vegetarian menu was refreshing in that region. The flexibility of the menu was fun. 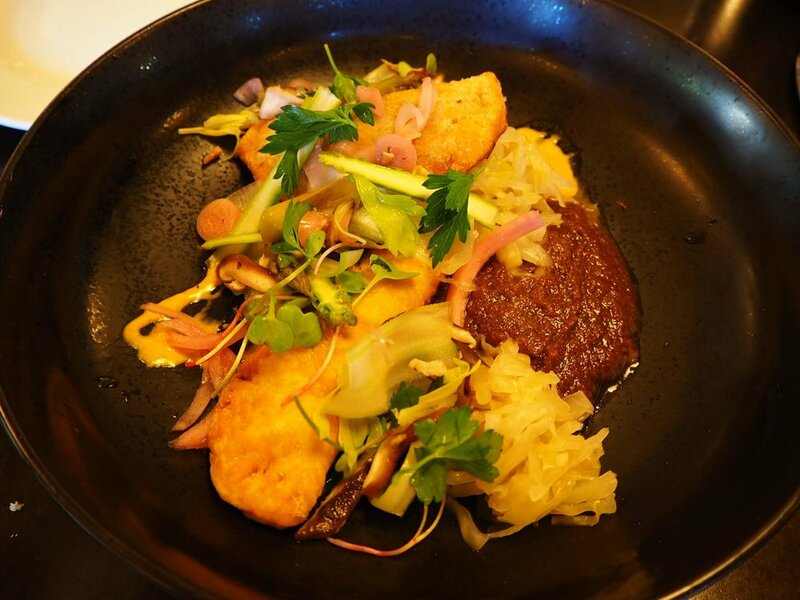 We created our own tasting menu of smaller plates, sampling items from both the regular and vegetarian menus, and the resulting meal was a culinary adventure. We were both uncomfortably stuffed by the time we were done--to be expected with the food marathon we knowingly embarked upon--but we also finished the meal feeling immensely satisfied. The vegetable carpaccio was appropriately light and refreshing for the hot outdoor temps. Yellow watermelon paired well with tomato tartare, ricotta vinaigrette, and herb tuille. Plus, the presentation was gorgeous. The pea cheesecake was next, and it was the star of the show. Our waitress struggled to describe the dish when we asked about it, but after trying it, the dish title really is all you need. 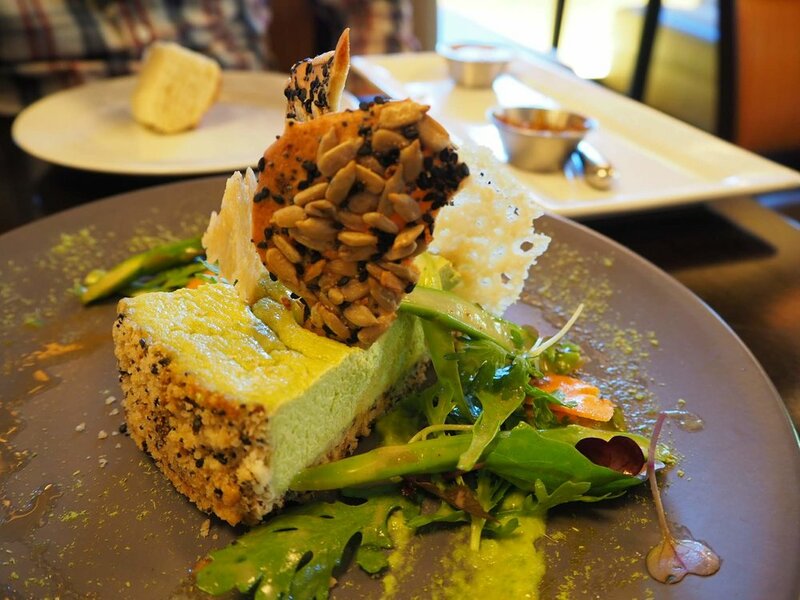 Imagine a savory cheesecake made from whipped pea puree and an everything bagel crust. It was unique, it was light, it was seasonal, and we loved everything about it. Perfection. From there, things got heavy. The duck egg raviolo was too tempting to ignore when perusing the menu, but unfortunately, the description was such that we weren't expecting it to be deep-fried. And deep-fried it was! 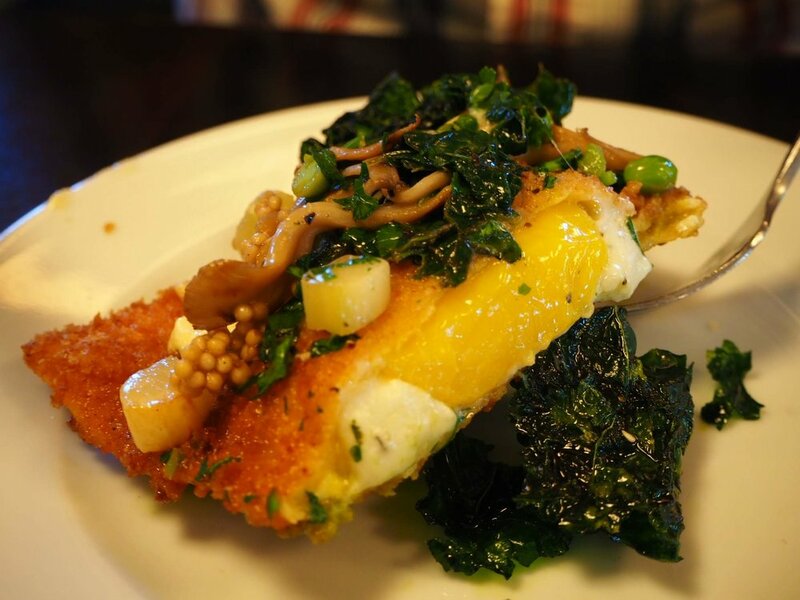 Imagine a 3x5" ravioli deep-fried in duck fat, and then stuffed with a fried duck egg. Yummy? Of course. How could that not taste good? But it was also stupid and unnecessarily heavy. Why do so many chefs insist on frying things? Food tastes good without frying it. Cut it out, yo! I prefer to eat good stuff without destroying my insides. Alas, we ate the veggie hand pies with mushrooms after the duck egg raviolo, when we were just about ready to explode. That was a darn shame, too, because the hand pies were right up there with the pea cheescake. Presented with ramps, sauerkraut, maitake (mushroom) ketchup, and chili crema, this dish was surprising and packed a major flavor punch with every bite. Even after I felt that I could not possibly eat another bite of the hand pie itself, I couldn't refrain from eating sauerkraut smothered in the maitake ketchup and chili crema. The combination was absolutely genius. I mean, mushroom ketchup? Amazing. All in all, I wish we could have eaten in the East Hills neighborhood of Grand Rapids for an entire week. My belly limitations were irritating with such interesting and widespread culinary options laid out before us. Literally, all in one spot. Though we managed to cram three meals into six hours, we barely scratched the surface; we have yet to sample the goods at Cherie Inn, Furniture City Creamery, Maru Sushi, or the Green Well Gastropub, all on the same stinking block as Grove and Brewery Vivent! Man oh man. East Hills, you have captured my heart! Kudos, Michigan. You surprised us! In particular, Grand Rapids is a great spot for the beer connoisseurs and foodie adventurers our there. Gas and food prices were a tad high compared to St. Louis, but other than that, Western Michigan offers an affordable, fun vacation spot that can probably keep just about anyone happy. Stay tuned for upcoming travel reviews of New York City, Paris, Dijon, Strasbourg, and Lucerne. Cheers to "Do Everything Year"!